The congress will hold a call for papers for everyone interested in terraces and terraced landscapes (scholars, researchers, agronomists, etc.) to participate in and contribute to the discussion on the recognition, recovery, and protection of terraced landscapes and strategies for new terraced landscape projects: that is, toward Re-Enchanting Terraces. 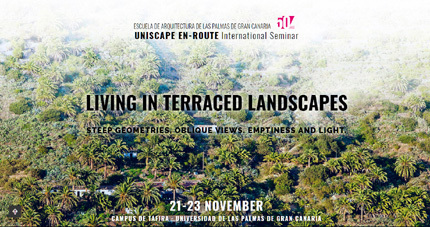 The call is included in the Uniscape En-Route International Seminar titled “Living in Terraced Landscapes”, will be held from 21st–23rd of November 2018 en Gran Canaria. This entry was posted on Friday, August 31st, 2018 at 10:43 and is filed under landscape, news, paisea, public space, seminar, without category. You can follow any responses to this entry through the RSS 2.0 feed. Both comments and pings are currently closed.